Although it's kinda cool, who would do such a thing???? I just saw something on this recently. Some of them actually were painted from the factory in a misguided attempt to boost demand while the company was on the skids. 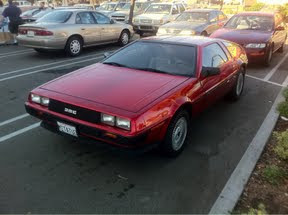 If its the same delorean I'm thinking of, it was in an accident & had bodywork. Stainless doesn't look as cool with bondo... Shame they didn't metalwork it all... But them again, what's a delorean worth?